Experience everything that ‘The Big Easy’ has to offer on this unique total day tour. Dig into the delicious flavors that make New Orleans one of the USA’s top foodie destinations, enjoy some classy cocktails in the famous French Quarter and hear all about the origins of jazz before visiting a few of our favorite local jazz clubs. By the end of this all-encompassing tour, you’ll be hooked on gin and jazz and a bona fide expert on North America’s Mardi Gras city! Your New Orleans Total Day Tour starts where it all began, on the banks of the Mississippi River. From here, you’ll witness the lifeblood of this region which brought new cultures, new influences and new ingredients to the USA through its ports. As they say, breakfast is the most important meal of the day. To wake up your taste buds, we’ll indulge in New Orleans’ most iconic breakfast pastry, the beignet. 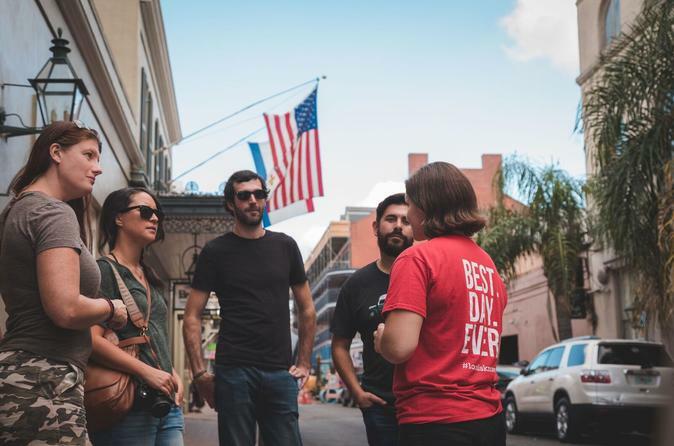 Next we will head to The French Market, the site of America’s oldest public market and then on to the picturesque streets of the French Quarter where your guide will take you to some of their favorite palate-pleasing spots. You’ll sample both a classic dish, as well as a delicacy that you’ve probably never seen outside Cajun country. You’ll then have the chance to try a dish that sparks more controversy amongst chefs than any other in New Orleans: gumbo. We’ll also indulge in a sweet treat made from locally grown sugarcane and the region’s abundant pecans. There will then be an opportunity to have a coffee or do some souvenir shopping in the French Quarter with your guide before we take a short walk to Jackson Square, where we’ll begin the cocktail portion of your total day tour! We will be going beyond the tourist trail to show you what really makes New Orleans cocktail culture unique. For our first cocktail stop we will travel back to the 1700s and visit a bar which used to entertain some of the most eccentric characters in New Orleans history. We will taste a famous drink of the city and learn how it has influenced New Orleans drinking culture today. We will then visit one of your guide’s favorite bars and taste a drink so good you’ll forget there’s alcohol in it. There will be an opportunity to rest your feet or grab a bite to eat before the jazz portion of the tour begins. Then we’ll head over to the historic and beautiful Louis Armstrong Park in the Tremé neighborhood. From here, we will make our way to the popular Marigny neighborhood, a hip nightlife area that’s home to the famous Frenchmen Street. Being with a local, you’ll have access to the best options, depending on the day of the week, time and band schedules. And to top it off, you will receive a beer on us at one of the stops. Your total day tour ends at the nightly art market, another lively spot where the city’s artists show off their best work, from handmade sculptures to local photography.